Is Laundry Only A Woman’s Job? There was a time when the term ‘working woman’ was not so much in vogue. Women used to stay at home taking care of household chores and family members. Time has changed, and women now share equal responsibilities along with men in every sphere of life. Most of the urban families now run on dual income basis where both husband and the wife take care of financial necessities. But surprisingly enough, the tendency to infantilize women is still very much in practice which states the fact that a section of the society still finds it fine to think that women are homely creatures and are made to perform daily household activities only. Thus, a high sense of inequality still exists between men and women in Indian households. A recent survey conducted by Ariel India in association with AC Nielsen in Mumbai, Delhi, Chennai, Hyderabad & Bangalore, in November 2014 shows some egregious statistics! It says that 76% of Indian men feel, laundry is a woman’s job. Though sounds unbelievable but a harsh reality is that most men love to think themselves superior to women and so essential activities like cooking, cleaning and laundry are sub-standard activities according to them. But aren’t these the very foundation of a family life? Can you imagine attending a meeting wearing a soiled shirt and a cringed, dirty pair of trousers? Sounds nightmarish, isn’t it? I think one should be self-dependent and that includes sharing some responsibilities in household works too. Laundry has now become quite an easy job with the invention of washing machines and advanced washing powders so I think it’s the right time to raise the question whether it is only a woman’s job. I can remember during my childhood my father used to wash his own clothes on every alternative day after returning from the office. My brother picked up this habit from him and never in our family Maa was loaded with heaps of dirty clothes to wash at the weekends. Rather, it was me who was extremely lazy and most of the times I bothered my brother to wash my school uniforms which inevitably had ink stains. My mother, though highly educated, preferred to remain at home. But these days most of us love to be financially independent and so have stepped outside. Women are seen everywhere today, they’re working with the same efficiency and responsibility as men. At the end of the day, we are returning home equally tired and fatigued. But the inequality resides at our homes. The mentioned survey also reveals that a staggering 85% of working women feel, that they have two jobs, one at work, and another at home. Most humbly I just want to say that there is no shame in lending a hand to your wife or mother in household activities. I’ve made my son understand the fact that putting his dirty T-shirts, jeans etc in the laundry basket is his duty and he should not throw them here and there. I even encourage him to learn the process of doing laundry with the washing machine. I believe it will help him to be a better and helpful family person in the future. My husband, though loves to cook ( and he is a good cook) prefers to stay away from laundry. Soon after our marriage, one fine Sunday morning I confronted with a small hillock of dirty clothes, and my Sunday went awry understanding the fact, that, I had to clean them! Cleaning is not a single process you know, it also includes drying and ironing and then putting them neatly in cupboards. I did all the steps perfectly. In the evening, I asked her jokingly whether he would be able to do all the things which I can. His male ego boosted up and he readily said,”Yes, why not..anything and everything”. I calmly asked him to do the laundry for the next week. He took the challenge and understood the fact that it could really be a cumbersome task when done singlehandedly. From that day onwards, he always helped me with the laundry. Small household helps really bring great happiness. 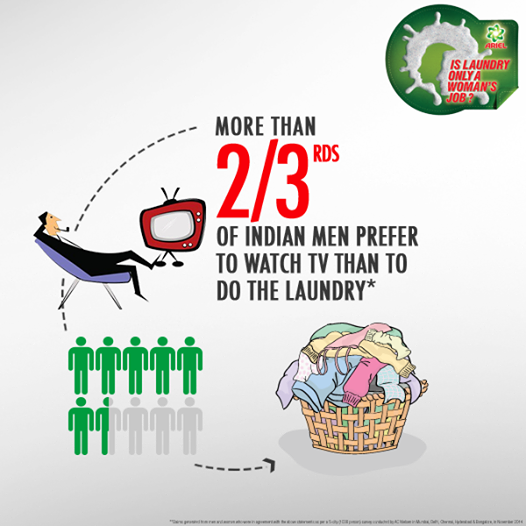 So though the survey says that more than 2/3rds of Indian men prefer to watch TV than to do the laundry, I can happily conclude that my man belongs to the minority in this case. He is among those 1/3rds who find it neither shameful nor useless to help me doing the laundry. The stain, which is associated with normal household chores in the minds of millions of Indian men, is not easy to remove. Even an excellent ‘stain remover’ like Ariel would find it quite difficult. But times are changing and so are our male counterparts. I hope one day this inequality will be eradicated and laundry would no more be considered as women’s prerogative. Meanwhile, enjoy this short, effective video, keep smiling and ask yourself #IsLaundryOnlyAWomansJob? Well, the two should become one, and so I do laundry, cook, clean and do many other things, out of love. My mother taught me well and she told me I would be a gift for a wife…if i followed her instructions. I believe all wives are treasures to be cherish, so I would always be more than happy share all! Wonderful message Maniparna, and I have missed you also my sister! Hugs and blessings! Hi, Have I told you before that I lOVE reading your blogs. I am kind of lucky too, I do the laundry but then my dad in law and husband helps me out. And so is it with cooking and cleaning as well. There are times when my husband likes to be pampered but I don’t mind it at all. Because first, he is there and helps me when I need him second I enjoy taking care of him! Very well written Maniparna! Couldn’t agree more with you, Maniparna! In my country there’s perhaps some more equality, men don’t feel so superior or at least they don’t say it. But those who don’t know how to knit a button or how to cook a simple boiled egg don’t know how much they’ll be losing in a divorce… while the woman will have a well organized house as always, the man will be eating bad, frozen stuff and dust fluffs will eat him for not cleaning! I am a dude and I do laundry for my whole family. This could just me but I think this being blow out proportion. In a real relationship it really doesn’t matter who does what. There is no such thing as “man’s job” or ” woman’s job”. I don’t get what the big deal is. If a woman wants to cook do laundry and take care of the house work should she feel shameful for it? also in the other hand if a guy wants do house work like cooking and laundry with or without wife why should he feel bad for doing so? People can do whatever they want without having to feel what society deems to be “sexist”. I don’t agree with this whole house wife shaming thing because if she is happy doing it why take it from her? in the other hand why should people make fun at guys who cooks and clean? (like me). People are just so focus on who’s work is what that they don’t care about what someone’s personal feeling might be on the subject. relationship is all about compromising so setting a bunch of close minded rules whether feminist or whatever isn’t right. Why can’t all just get along? If only all people were like you!! If only society doesn’t label specific jobs as ‘man’s’ and ‘woman’s’ ….. the world will be a much, much better place. I am glad i am not one of the 76% 🙂 maybe if i was living in india i would have been but coming to uk has taught me a lot of things .. here I AM THE MAID for everything myself ..
What you’ve said, is the scenario in Indian society and I sincerely hope one day all of us would understand the dignity of labour. Glad you agree with my views 😀 …. There is something about laundry and I must say, I don’t like doing it but someone has to do it 😀 Great post and writing! Really well written article..True scenario of today’s family..! !